March 23, 2019, will mark the 88th martyrdom day of Shaheed Bhagat Singh. 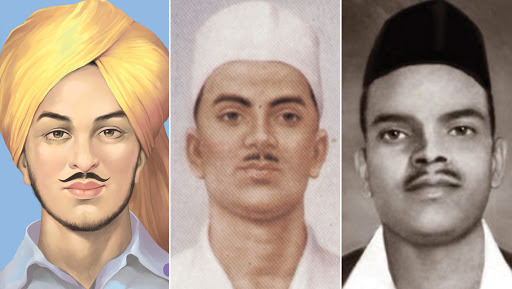 On March 23, 1931, Bhagat Singh along with his associates Sukhdev Thapar and Shivaram Rajguru were hanged to death for the assassination of 21-year-old British police officer John Saunders. They mistook Saunders, who was still on probation, for the British police superintendent, James Scott, whom they had intended to assassinate. They believed Scott was responsible for the death of popular Indian nationalist leader Lala Lajpat Rai, by ordering a lathi charge in which Rai was injured, and, two weeks after which, died of a heart attack. A police constable was also shot dead along with Saunders by Chandra Shekhar Azad. Bhagat Singh Quotes in Hindi on Freedom Fighter’s 111th Birth Anniversary Will Make Your Heart Swell With Patriotism and Pride. In April, 1929, Singh and his associate Batukeshwar Dutt, exploded two improvised bombs inside the Central Legislative Assembly in Delhi. They showered leaflets from the gallery on the legislators below, shouted slogans, and then allowed the authorities to arrest them. The main motive of Shaheed-e-Azam was to highlight the plight of Indians who were suffering from atrocities of the Britishers. In the jail, Bhagat Singh and his associates went on a hunger strike, demanding better prison conditions for Indian prisoners. The strike was called off after the death of Das. Bhagat Singh’s 111th Birth Anniversary: Twitterati Remember the Legendary Revolutionary, Here Are Few Lesser Known Facts About the Freedom Fighter. Bhagat Singh, Sukhdev and Rajguru were hanged to death 11 hours before the scheduled time for Saunder's murder case. Azad was also ambushed in a park in Uttar Pradesh’s Prayagraj by British Police. He shot himself with the last bullet to avoid being captured by the Britishers. Shaheed Diwas 2018: SAD Leader Prem Singh Chandumajra Demands For a Holiday on March 23. Bhagat Singh is not only a freedom fighter but also had a dream to free India from age-old discriminatory practices of caste, creed, religion and superstition. He is also a socialist, a great political thinker and a prolific writer. Some of his favourite authors were Bertrand Russell, Trotsky, Karl Marx, Frederick Engels, V.I. Lenin, Upton Sinclair, Robert Louis Tennyson and Rabindranath Tagore.